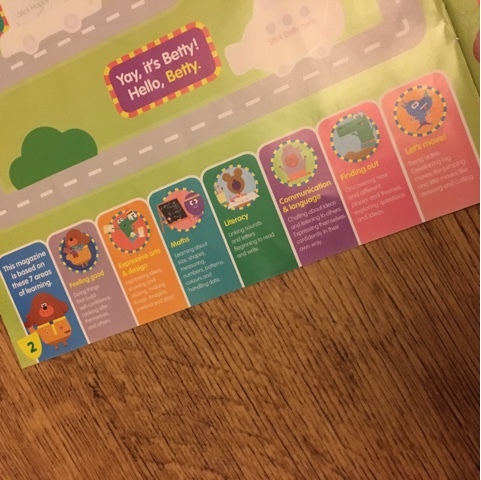 When we were recently invited to review the new Hey Duggee official magazine I didn't actually know what Hey Duggee was, we popped over to the Cbeebies website and took a look and T really enjoyed it. It's now a favourite on his iplayer and we have a few downloaded to his iPad. Most of the time there are benefits to not watching 'live' TV but then sometimes I think maybe we do miss out on little gems like this because we don't really come across them by chance. 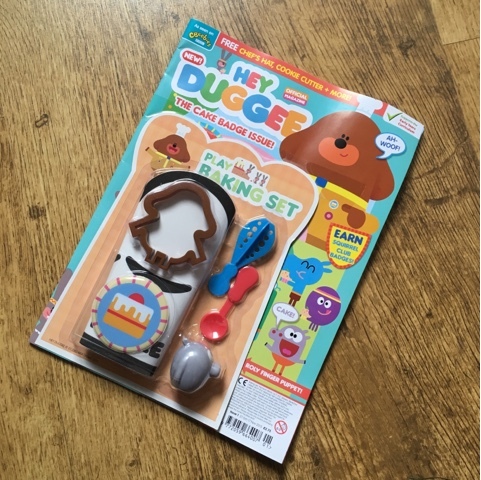 T was very excited to receive his first Hey Duggee magazine in the post, and of course, before anything else he wanted to open the 'free' gift and see what was in there. He was mostly impressed with the cookie cutter which immediately meant that the play dough came out so he could try it! 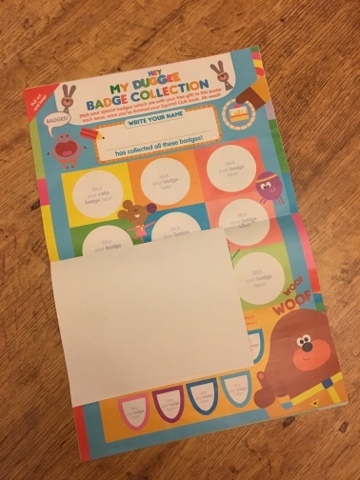 The second thing that gets checked are the stickers, the stickers in this magazine are of good quality and are easy to remove and durable for little hands, something we always seem to have an issue with is T ripping stickers as he's a bit heavy handed, we didn't find this a problem with these. T also loved the chefs hat, he's going to wear that at the weekend when we make our cookies and he can 'earn' his cooking badge. Daddy also got the privilege to try it on! T was very proud to be called a member of the squirrel club which I personally think is a great motivational idea. It also promotes other good practice ideas, such as cleaning after yourself in the kitchen and making people happy. I think they are great additions to the fab activities the magazine also has to offer. 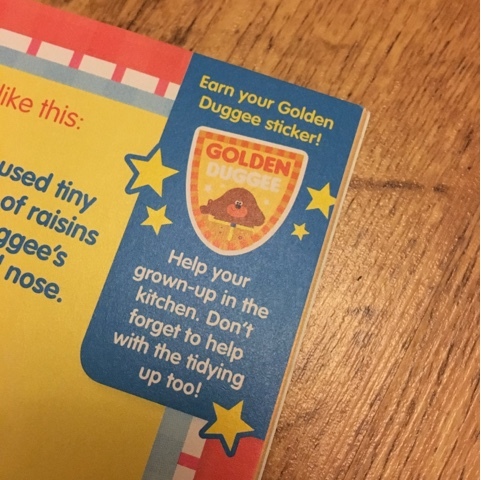 Cleaning in the kitchen also earns the squirrels a special golden badge which is included on the sticker sheet. The magazines activities cover 7 key learning areas and are aimed at children between the ages of 2-6 with the core age being 4, from our experience, this is probably spot on, T is coming up to 4 and the activities and games suit him and keep him engaged. The learning activities are either just right or a little challenging for T which is exactly what he needs at the moment. Absolutely perfect for pre-schoolers or reception children just getting into reading and writing. T loved the 2 stories in the magazine and was a little disappointed that there wasn't another for the next bedtime but apart from that it really has gone down a storm in our house! Priced at £2.75 per magazine it's a lot cheaper than some on the market in my opinion (average £3.99) and makes it more affordable as a special once a month treat! 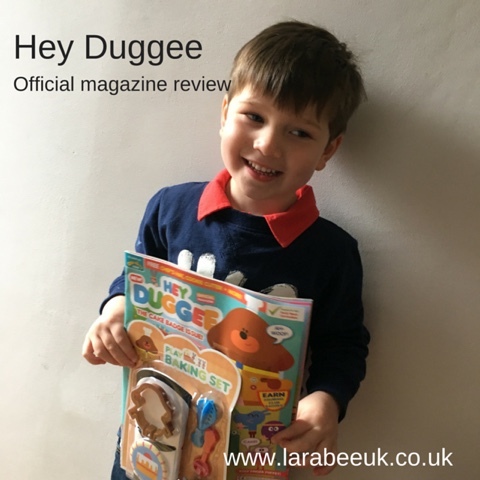 Hey Duggee official magazine launches today - 21 October 2015! Disclaimer: we were sent this magazine and given a years subscription, for this honest review.